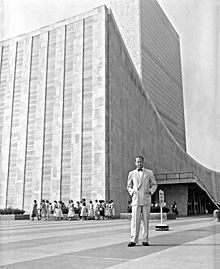 Dag Hammarskjöld (29 July 1905 – 18 September 1961) was a Swedish diplomat, the second United Nations Secretary-General, and a Nobel Peace Prize recipient. Everything will be all right... When people, just people, stop thinking of the United Nations as a weird Picasso abstraction, and see it as a drawing they made themselves. A man of firm convictions does not ask, and does not receive, understanding from those with whom he comes into conflict. … A mature man is his own judge. In the end, his only firm support is being faithful to his own convictions. The advice of others may be welcome and valuable, but it does not free him from responsibility. Therefore, he may become very lonely. Do we refer to the purposes of the Charter? They are expressions of universally shared ideals which cannot fail us, though we, alas, often fail them. 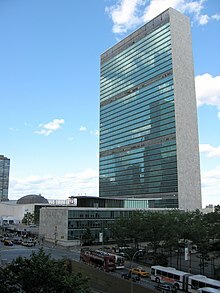 Or do we think of the institutions of the United Nations? They are our tools. We fashioned them. We use them. It is our responsibility to remedy any flaws there may be in them.... This is a difficult lesson for both idealists and realists, though for different reasons. I suppose that, just as the first temptation of the realist is the illusion of cynicism, so the first temptation of the idealist is the illusion of Utopia. "An International Administrative Service", From an Address to the International Law Association at McGill University, Montreal, 30 May, 1956. Wilder Foote (Ed. ), The Servant of Peace, A Selection of the Speeches and Statements of Dag Hammarskjöld, The Bodley Head, London 1962, p. 116. It is not the Soviet Union or indeed any other big Powers who need the United Nations for their protection. It is all the others. In this sense, the Organization is first of all their Organization and I deeply believe in the wisdom with which they will be able to use it and guide it. I shall remain in my post during the term of my office as a servant of the Organization in the interests of all those other nations, as long as they wish me to do so. In this context the representative of the Soviet Union spoke of courage. It is very easy to resign; it is not so easy to stay on. It is very easy to bow to the wish of a big power. It is another matter to resist. As is well known to all Members of this Assembly, I have done so before on many occasions and in many directions. If it is the wish of those nations who see in the Organization their best protection in the present world, I shall now do so again. You try to save a drowning man without prior authorization. Statement on UN Operations in Congo before the General Assembly, 17 October 1960. Shall my soul meet so severe a curve, journeying on its way to form? Setbacks in trying to realize the ideal do not prove that the ideal is at fault. Servant of Peace : A Selection of the Speeches and Statements of Dag Hammarskjöld, Secretary General of the United Nations (1962), p. 107; this has sometimes been paraphrased: It is in playing safe that we create a world of utmost insecurity. Variant translation: Friendship needs no words — it is a loneliness relieved of the anguish of loneliness. Variant translation: For all that has been — thanks. For all that will be — yes. He who has surrendered himself to it knows that the Way ends on the Cross — even when it is leading him through the jubilation of Gennesaret or the triumphal entry into Jerusalem. Do not seek death. Death will find you. But seek the road which makes death a fulfillment. I don't know Who — or what — put the question, I don't know when it was put. I don't even remember answering. But at some moment I did answer Yes to Someone — or Something — and from that hour I was certain that existence is meaningful and that, therefore, my life, in self-surrender, had a goal. In the faith which is "God's marriage to the soul", you are one in God, and God is wholly in you, just as, for you, He is wholly in all you meet. With this faith, in prayer you descend into yourself to meet the other. In the last analysis it is our conception of death which decides our answers to all the questions life puts to us … Hence too the necessity of preparing for it. Life only demands from you the strength you possess. Only one feat is possible — not to have run away. Never, "for the sake of peace and quiet," deny your own experience or convictions. "But I say unto you, that every idle word that men speak..."
Variant translation: The longest journey is the journey inward, for he who has chosen his destiny has started upon his quest for the source of his being. "To forgive oneself"—? No, that doesn't work: we have to be forgiven. But we can only believe this is possible if we ourselves can forgive. You are merely the lens in the beam. You can only receive, give, and possess the light as the lens does. I have only my own burden to bear. You are not the oil, you are not the air — merely the point of combustion, the flash-point where the light is born. You are merely the lens in the beam. You can only receive, give, and possess the light as the lens does. If you seek yourself, you rob the lens of its transparency. You will know life and be acknowledged by it according to your degree of transparency — your capacity, that is, to vanish as an end and remain purely as a means. Your body must become familiar with its death — in all its possible forms and degrees — as a self-evident, imminent, and emotionally neutral step on the way towards the goal you have found worthy of your life. It is easy to be nice, even to an enemy — from lack of character. Creative people have to be fed from the divine source. It will not surprise you to hear that Dag Hammarskjöld is a figure of great importance for me — as he must be for any Secretary-General. His life and his death, his words and his action, have done more to shape public expectations of the office, and indeed of the Organisation, than those of any other man or woman in its history. He would remind us how man once organized himself in families, how families joined together in tribes and villages, and how tribes and villages developed into peoples and nations. But the nation could not be the end of such development. In the Charter of the United Nations he saw a guide to what he called an organized international community. With an intensity that grew stronger each year, he stressed in his annual reports to the General Assembly that the United Nations had to be shaped into a dynamic instrument in the service of development. In his last report, in a tone of voice penetrating because of its very restraint, he confronted those member states which were clinging to "the time-honored philosophy of sovereign national states in armed competition, of which the most that may be expected is that they achieve a peaceful coexistence". This philosophy did not meet the needs of a world of ever increasing interdependence, where nations have at their disposal armaments of hitherto unknown destructive strength. The United Nations must open up ways to more developed forms of international cooperation. He has a physical stamina unique in the world, a man who night after night has gone with one or two hours of sleep and worked all day intelligently and devotedly. The problem is not the death of one man — the problem is the life of this organization. It will either grow to meet the challenges of our age, or it will be gone with the wind, without influence, without force, without respect. Were we to let it die, to enfeeble its vigor, to cripple its powers, we would condemn our future. For in the development of this organization rests the only true alternative to war — and war appeals no longer as a rational alternative. Unconditional war can no longer lead to unconditional victory. It can no longer serve to settle disputes. It can no longer concern the great powers alone. For a nuclear disaster, spread by wind and water and fear, could well engulf the great and the small, the rich and the poor, the committed and the uncommitted alike. Mankind must put an end to war — or war will put an end to mankind. I realise now that in comparison to him, I am a small man. He was the greatest statesman of our century. It was in the cause of his activities in the interest of peace that the late Dag Hammarskjöld lost his life. Of his work a great deal has been written, but I wish to take this opportunity to say how much I regret that he is not with us to receive the encouragement of this service he has rendered mankind. … How many times his decisions helped to avert a world catastrophe will never be known. But there are many of such occasions, I am sure. But there can be no doubt that he steered the United Nations through one of the most difficult phases in its history. His absence from our midst today should be an enduring lesson for all peace-lovers, and a challenge to the nations of the world to eliminate those conditions in Africa, nay, anywhere, which brought about the tragic and untimely end to his life. This, the devoted Chief Executive of the world. Review : "Markings - the spiritual diary of Dag Hammarskjöld"